An undated picture released from Korean Central News Agency on November 6, 2008, shows Kim Jong Il inpsecting a drill ground of a sub-unit of Korean People's Army Unit 534 at an undisclosed location. 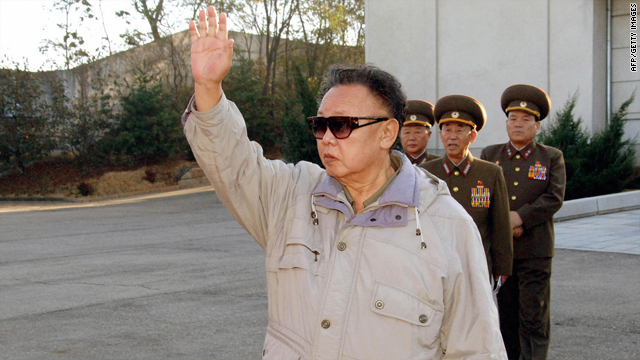 (CNN) -- North Korean leader Kim Jong-Il is expected to meet with Chinese President Hu Jintao in Beijing on Thursday in a move that some hope will trigger the return of six-party denuclearization talks, South Korea's Yonhap News Agency reported. Kim is believed to have arrived in China early Monday by train via the border city of Dandong, Yonhap reported earlier this week, citing unnamed sources in Seoul and Beijing. His trip to the country comes as North Korea is seeking a conditional return to the six-party talks, Yonhap said, citing the terms as a peace treaty with the United States to end what North Korea considers a state of war on the Korean Peninsula, and the lifting of U.N. sanctions against North Korea. "It is predicted that the summit talks between North Korea and China will be held on Thursday," Yonhap quoted an unnamed a source in Beijing as saying. North Korea last year cut off the six-party talks also involving the United States, China, South Korea, Japan and Russia, in anger over international criticism of its nuclear and missile tests. Yonhap said Thursday's expected meeting may lead Pyongyang to rejoin the stalled talks in return for heavy economic aid from Beijing.